Give this easy salad for your hamster to eat. 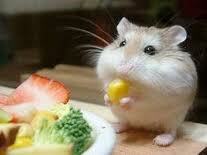 Wash all the vegetables (it is good for your hamster). Cut the carrot and cucumber in small pieces. Cut the ladyfinger into very small pieces. Cut the lettuces and cabbages very small. Also cut the broccoli and beetroot. Then put all the vegetables with the others. Add the watercress leaves, then the small piece of cheese with other things. Then add the yogurt for good taste.